Six – my books. my life. It’s hard to believe it’s been six years since I married Ben. I always joke about how it could have turned out to be a horrible decision (we were VERY young) but, of course, it didn’t. I spent the morning looking back at our six years together and all of the wonderful experiences and adventures we’ve had. I can’t wait to see what the next six/sixteen/sixty years of marriage brings. Aw, Happy Anniversary, Michelle and Ben! Happy Anniversary! I can’t believe I did not know that you were married, I must not have been paying attention – sorry. The pictures are really cute! Happy Anniversary to you both! I love the collage! 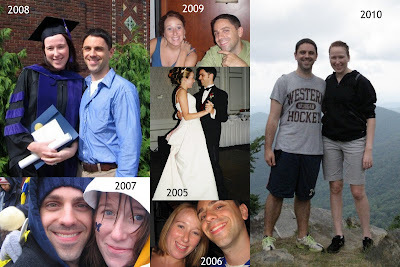 Congratulations on six great years together! Here’s to many, many more. Happy anniversary! Happy anniversary! I wish you guys many more happy years together! Happy anniversary! And as someone who got married at the age of 21, yay for young marriages and bucking the trend! I am bit late in commenting 😦 Belated Happy Anniversary Michelle! The collage is very beautiful! Hope both you and Ben had a wonderful time on Saturday! I’m a couple days late, but happy anniversary! Aw, ho sweet. Marriage can be wonderful and it’s nice to see you found a good one!